Calcium and Boron deficiency in plants is determined by test, observation, or known nutritional needs of certain plants and/or systems. 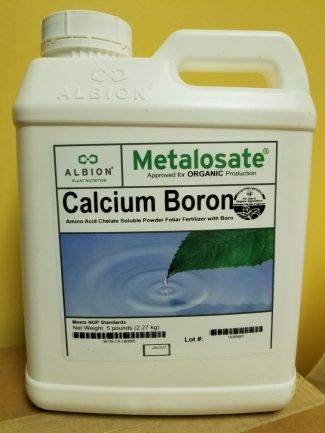 Albion Metalosate Calcium Boron provides easily absorbable and “plant friendly” calcium for immediate use by the plant. Albion Metalosate Calcium Boron is highly water soluble, with excellent uptake efficiency when applied as a foliar spray or through drip irrigation. Calcium and Boron are a major part of the structural “skeleton” of the cell wall. A strong cell wall structure can resist disease organisms more effectively. This can lead to less disease incidence in the field and increased shelf life for the crop postharvest.